Several reports emerged on Thursday about the New York Mets and Seattle Mariners being in serious discussions on a blockbuster trade. The reports have Edwin Diaz and Robinson Cano going to the Mets, and Anthony Swarzak, Jay Bruce, and multiple prospects going to the Mariners. And it appears the trade will indeed happen. Jeff Passan of Yahoo! Sports reports that the trade “is expected to be completed by Friday,” with “at least two prospects” going to Seattle in the deal. The blockbuster trade that would send Robinson Canó and Edwin Díaz to the New York Mets for Jay Bruce, Anthony Swarzak and at least two top prospects is expected to be completed by Friday, league sources familiar with the deal tell Yahoo Sports. MLB.Com’s Anthony DiComo adds that the Mets “have begun informing players in the deal,” and no other Mariners are involved in it. Developing: The Mets and Mariners are close on a deal that would send Robinson Cano and Edwin Diaz to New York, per sources. Nothing will be final tonight, but it could be done by the end of the week. The Mets have begun informing players in the deal. No other Mariners involved. The Mets are doing this to try to win games in 2019. The Mariners are doing this to save money and enter a full-on rebuild. Cano, 36, has five years and $120 million remaining on his contract. He has a no-trade clause, but Fancred’s Jon Heyman doesn’t think Cano — a former Yankee — will hesitate to waive the clause and allow a trade to New York. The prize of the deal is Diaz, who’s just 24 and is under team control (likely “cheaply”) for four more years. 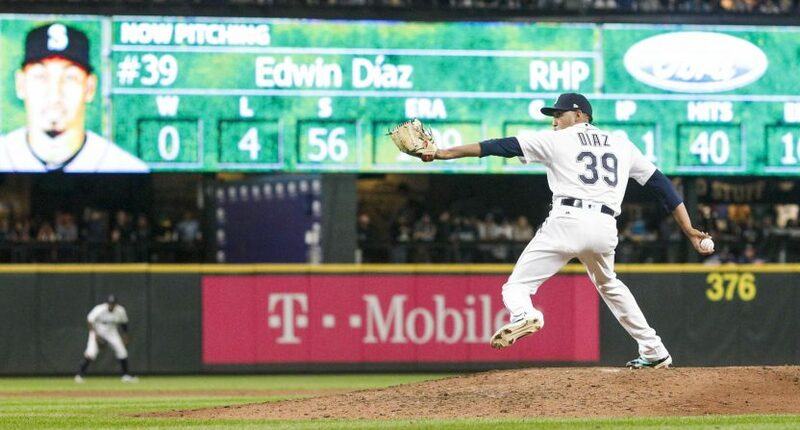 Diaz is coming off a ridiculous 2018 season in which he had 57 saves in 61 attempts, with 124 strikeouts in 73 1/3 innings (15.22 K/9), a 1.96 ERA, and 1.61 FIP. FanGraphs has Diaz at 3.5 WAR in 2018, behind only Blake Treinen (3.6) among MLB relievers. Bruce and Swarzak are veteran players that neither team likely wants, but they go to Seattle to offset some salary in the trade. The Mariners are attaching Diaz to get the Mets to take on — at least a lot of — Cano’s salary, and to receive top prospects. Those prospects may include two former first round picks in outfielder Jarred Kelenic and right-handed pitcher Justin Dunn. Source: Two former first-round picks are among the #Mets prospects under discussion in talks with #Mariners for Cano-Diaz: OF Jarred Kelenic, 6th overall in 2018, and RHP Justin Dunn, 19th overall in ‘16. ”Significant momentum” in talks, per @JeffPassan. So, we know why the Mariners are doing it, even if there’s plenty of reason to debate if it’s the right move. Like, Diaz has a ton of value on his own, and it’s possible — without knowing the full-on prospect details of this trade — that he could’ve gotten Seattle a better haul at some point. But their side of the deal is much less interesting than New York’s side of the deal. And it would be the first significant move under new general manager and former agent, Brodie Van Wagenen. Here’s the thing with the Mets: they’re probably still not a playoff team (even if they make another substantial move or two this offseason). And this is the kind of trade you should only make as a team with realistic title chances. Diaz is an elite closer, but who cares about saves on a fourth-place team (which is where the Mets would be projected to be right now behind the Braves, Phillies, and Nationals in the NL East)? Cano had an .845 OPS and 136 wRC+ in 2018, and probably has a couple more good offensive seasons in him, but he’s old and his defense isn’t what it used to be either. It’s possible his offense drops off a ton immediately because this is usually what happens when players get into their late 30s. Sure, maybe deGrom repeats his 2018 NL Cy Young season, maybe Noah Syndergaard stays healthy for a full season and dominates, etc. You can see the path to the Mets being a contender again, and it’s understandable that they would like to try to take one more shot in the deGrom and Syndergaard window. But you could also argue the Mets would be better off rebuilding themselves, or at least not making trades like this.